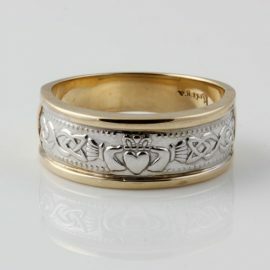 This band has the Claddagh on the top with a Celtic weave that goes half way around the band. The centre is 14kt white gold with 14kt yellow gold rails. Note – because of the half round design, this ring can be sized by your jeweler. Your potential adjustable range would be up or down 1-1/2 sizes. 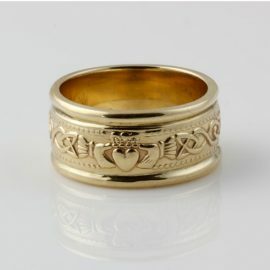 This 14kt yellow gold band has the Claddagh on the top with a Celtic weave that goes half way around the band. Only one in stock. Available in size 7-1/4. Take advantage of our “one of a kind” sale! This sleek ring is contemporary with beading on the edges. It is made of 10kt white gold. Available in size 10-1/2 only. 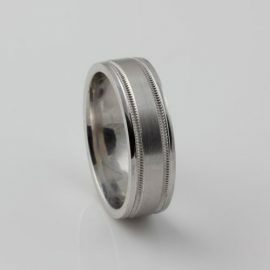 Note – due to the engraved design, this ring is not sizable. 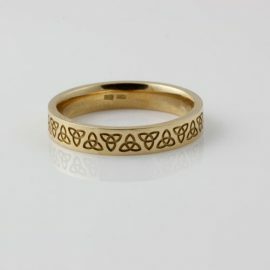 This sleek ring is an engraved trinity knot made of 10kt yellow gold. The narrow band is perfect for those who prefer something a bit understated. This ring is available in size 9-3/4 only. This Celtic ring was designed and manufactured by ring specialists with well over 20 years in the business. The Gents Trinity Knot Insert ring is handcrafted using hand made as well as modern manufacturing techniques. 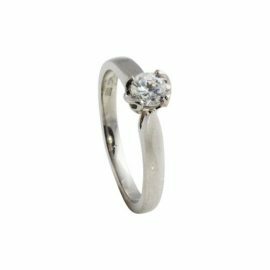 It is available in 14kt white gold in size 9-3/4 only. Note – this ring can be sized by your jeweler. Your potential adjustable range would be up or down 1-1/2 sizes. The open weave Infinity knot ring is made of 10kt yellow gold. This ring is a size 8.25. 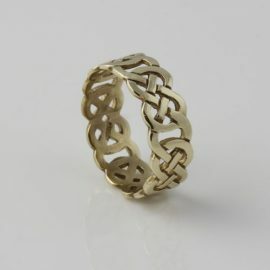 This is a simple, classic Celtic knot ring. If you like this ring and it is your size, don't delay as there is only one available. 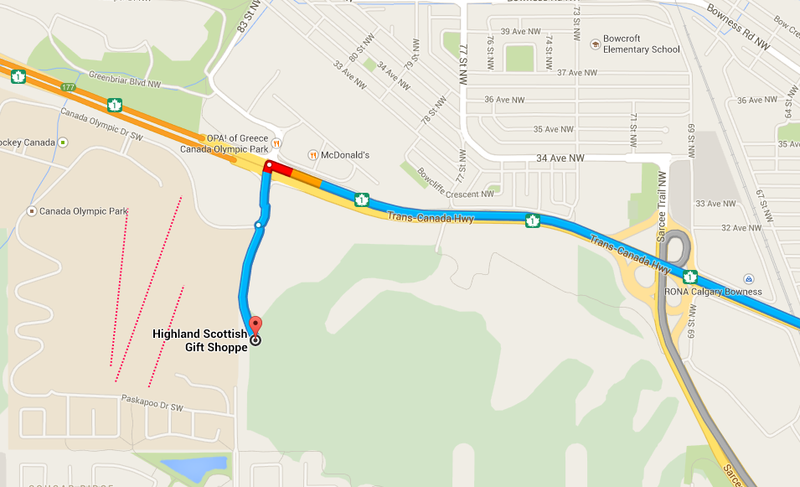 Note – due to the design this ring is not sizable. 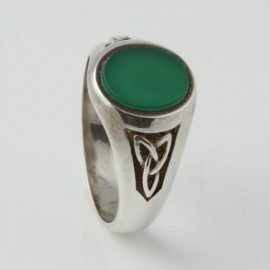 This signet style ring with the green acrylic insert with trinity knots on each shoulder is made of sterling silver. This one and only ring is a size 10. Note – this ring can be sized by your jeweler. Your potential adjustable range is probably from a 9 to 11. 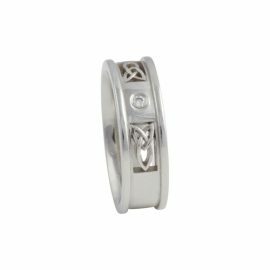 Get a great deal on this Celtic ring designed and manufactured by ring specialists with well over 20 years in the business. This 14kt white gold Trinity Knot engagement ring is set with a round 0.5 ct cubic zirconia and is handcrafted for you using hand made as well as modern manufacturing techniques. A nice simple engagement ring with just a touch of Celtic. Only one ring available in size 6.